About the book: The old mansion down the road from Rachel's ranch has always been her escape. No one has lived there for years, and she dreams of owning it herself someday. So when she finds a handsome city guy walking around inside who claims to own the home, her world turns upside down. 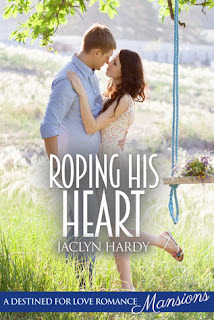 My review: I really enjoyed this Destined for Love Romance Mansions book! I loved the whole idea of Rachel saving up for years and years to buy the mansion she loves. She'd saved money under a floor board in the old house. Her family thought she was nuts, so it was her secret, but she was so close to being able to have her dream. Then it was snatched away! I loved Rachel, I loved the way that even though Patrick was unknowingly snatching her dream, she was still kind to him. She still offered to let him stay with her family, fed him and helped him with the house. Patrick's father has just died and he finds the deed to a house in small town Idaho, and he thinks that it might be the perfect place to relocate his business. But as he gets to know Rachel, her family, and the whole town really, he starts to fall in love the idea of just being there. I loved the way he tried to help out on Rachel's family's farm, even though he didn't have the right clothes, shoes, or any idea how to do it. I loved how he worked on the mansion again without knowing how to do things. This caused a problem for him a time or two, but it also showed him that he needed help from others. The plot of this one is fun. I loved the sweet romance, the characters and the setting. I love that it's a clean romance that you can pass on to your daughter or your grandma and they both will love it. Make sure you grab your own copy!